“Open confrontation will trigger over-powering resistance. That’s from Sun Tzu’s infamous work, The Art of War. This book, and the military strategies contained within, have stood the test of time—having been adopted by numerous people into their jobs. It seems cyber attackers are no exception: when faced with a major organization’s defenses, they can’t come in guns a-blazin’. The element of surprise is their main key to success. And, as evidenced by the long (and still-growing) list of victims in 2017 alone, it may as well be a skeleton key. “The position of victory is one of determination. Long gone are the days when having a purely defensive-minded system in place counts as ‘preparedness.’ Only in Hollywood will you see lights flashing, alarms blaring, and security teams waging war whenever a cyber attack befalls a network. Today, usual signs that a breach has occurred are: receiving a ransom email asking payment for the stolen data; finding said data leaked somewhere in the dark web; or any other equally humiliating and damaging scenario. What’s worse, there are times when attackers succeed in flying under the radar, leaving no trace at all of their intrusion. In any case, if you’re not in a position to seek out threats, you’re in a position of defeat. And that’s barely even scraping the surface of what’s in the course. 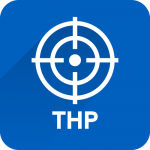 Coupled with a vast array of training materials and a number of real-world Hera Lab scenarios, Threat Hunting Professional delivers the robust eLearnSecurity training experience. 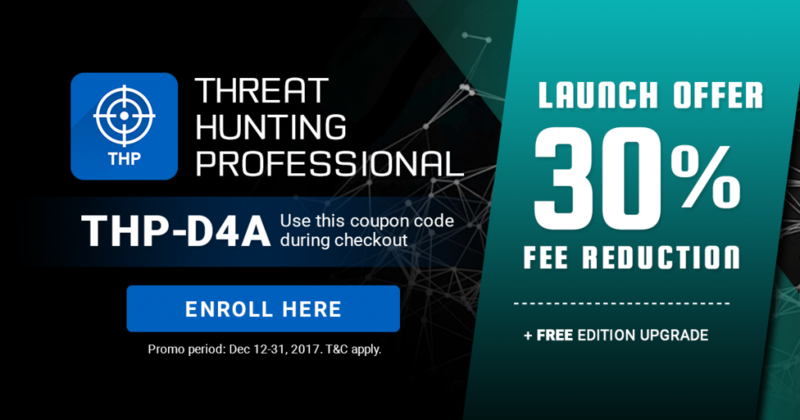 From now until the end of December, we’re cutting 30% off Threat Hunting Professional enrollment fees, and giving everybody a free Edition upgrade! Students who ‘enlist’ into the course during this launch period will be able to save over $500. And, to existing students: we’ve shot off an email over to your inboxes containing your exclusive launch deals! You may also check with the Support team if you want to know more. Go on the Hunt for free with the All Access Pass! Also this December, enrollees into the All Access Pass bundle will receive the Threat Hunting Professional training course in the Elite Edition for free! For the same bundle fee, students will get all TEN eLearnSecurity training courses—10 new certifications, hours upon hours of video training material, and over 780 usable hours of hands-on training in Hera Lab. That’s a staggering $6,600+ savings on security training! Learn more about the All Access Pass here. Give THP a shot before enrolling. Try the course by accessing this free course demo. The launch offer ends on December 31 2017 at 11:59 PM PT, though, so better hurry! Threat Hunting Professional gives you the skills to proactively hunt for threats and become a stealthier pentester. Try it for free here. Not much of a hunter? If Threat Hunting Professional isn’t on your holiday wish list, you can also check out several other training courses and bundles included in our Year-End Gift! Learn more here.